​The piece “Decision Fatigue” made its debut at Converge Dance Festival 2018 in the form of a 12-minute improvised structure featuring six dancers and the choices they made onstage. The piece is almost entirely structured improvisation, leaving the artists ample room to explore options and investigate movement while staying true to the world that we have created together. The dancers investigate ideas regarding gaining and losing control, inviting the audience to reflect on their own decision-making willpower. Every choice has an outcome. An alternative is available to nearly every action. What will we choose under each circumstance? In the spirit of celebrating female artists, this work is built on vulnerability, ferocity, and human connection. Much of the movement is inspired by collaborator Kathreen Absuelo's paintings, as well as Maiah Manser's musical style and haunting vocals. Moments of improvisation are weaved throughout, leaving the dancers freedom to find true expression in the moment and have the opportunity to be fully “seen” and present. The vocals are almost entirely improvisational, allowing Maiah to gauge what she is seeing and provide some sonic atmosphere to compliment the movement. There is no linear plot or story line to follow necessarily – our message is simply this: we are here, we are artists, we want to be seen. In her book Dance Improvisations, Joyce Morgenroth wrote, “Structured improvisation is a mixture of conscious choice and spontaneous reaction. It includes periods of sustained concentration and moments of unreproduceable magic.” This “magic” is what I have been chasing in my choreography this year. My project is an exploration of the ways that improvisation can be used as a tool for choreography and performance. The bulk of my project has included researching ways to use improvisation scores from the Judson Dance Theatre and other significant artists who were active choreographers in the 1960s, and presenting them in a way that combines them with my own movement and choreography style. I am drawn toward the works of the Judson Dance Theater because of the many different styles and experiments that came from this movement, from very neutral and straightforward, to eclectic and performative. I have a personal interest in improvisation because I find that it helps me as a dancer to stay active in how I think about the composition of what is happening around me. I love the spontaneity, and as an audience member I am always interested in the choices that the dancers make in the moment. For me, the freedom of spontaneously creating something with my body is something that will always reassure me that dancing is something that I am meant to do. We conceive a reality that we desire, ignoring the warning signs. We get locked in the immediate present with no thought to past or future, thinking we can change the present to affect the future while ignoring the past. Reality is perception born out of our imagination. This project was a collaboration with photographer William Munoz. We worked together to come up with visual and emotive themes that we were interested in exploring, and paired movement with a haunting piece of music. The result was an exploration of human desire, loss, and the constant search for the "ideal". The inspiration for this piece of choreography started with the desire to dance onstage in a certain dress. Simultaneously, I was experimenting with movement that contained themes of vulnerability and inner expression. The result was a piece that explores the deconstruction of society’s ideals of beauty, shedding of falsities, and finding oneself. The creative process started by experimenting with different ways that a ball gown can move, sounds that it makes, and what is interesting about it. I explored both conventional movements and movements that contradict what you would expect someone wearing this type of dress to do. I found movement motifs that I found interesting and expanded on them from there. I also experimented, separately, with ideas involving finding and listening to oneself, and how this can read to an audience. I was particularly drawn toward exploring how to transition from outward presentation into a place of self-exploration. Eventually I found ways that I connected to, and my hope is that audiences will connect to them as well. I hope to take the audience on an emotional journey, and also to make them think about the value that society places on beauty, and being put-together. How do two people move together naturally, and what emotions can different partnerships emit? These are the research questions I explored as I developed this project in creative scholarship. The result was a work of choreography entitled “Brief Encounters.” In this work, five dancers interact with a focus on partner work and how a duet can emulate a relationship or a conversation. A rehearsal process of collaboration and experimentation has resulted in an intricate and cohesive piece of choreography that incorporates motifs, relationships, and a natural story arch. The idea for this piece came from an interest in partner work, and how a duet can tell a story without being blatantly narrative. In building the piece there was a particular interest in improvised partnering, and how one person’s actions can depend upon the actions of their partner. This approach to choreography is original and significant because it represents abstract ideas about relationships that are relatable, and it comes from a rich creative process that heavily involved the dancers, resulting in movement that they can fully embody and own. Each duet is open to audience interpretation, which makes the piece intellectually stimulating, and yet there are also moments of beautiful physicality and architecture, making the piece visually appealing as well. 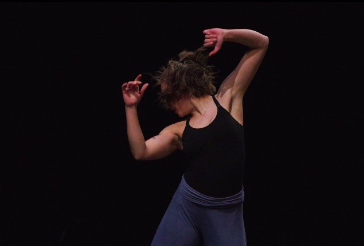 “Brief Encounters” was premiered in the UM School of Theatre and Dance’s Dance Up Close and was selected by the faculty to be presented in the University’s largest dance event of the year. I also plan to present a live excerpt at the UM Conference on Undergraduate Research.